If you have read my article on my favourite areas in Vienna, you have come across the Heiligenkreuzerhof already. It is a ensemble of Medieval buildings in Vienna′s old university district, near the Jesuite Church. Despite of its considerable size, it is fairly well hidden and you have to go through some narrow alleys in order to get there. The best way of approaching it is via Schönlaterngasse, a wonderful alley with Baroque and Medieval buildings. The Heiligenkreuzerhof itself consists of a couple of buildings arranged around a central courtyard. Here you find some tiny specialist shops, facilities used by the University of Applies Arts and (mostly) private apartments. 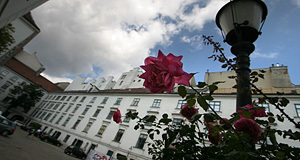 It is therefore often called "Vienna′s oldest apartment block". The Heiligenkreuzerhof was built by the Cistercian monks of Heiligenkreuz Abbey in the 12th and 13th century. It is still property of the order and frequently used as the monastery′s "Vienna branch". The only parts of the Heiligenkreuzerhof that actually date back to the 12th century are parts of the basement vaults. Most of today′s buildings was constructed between 1659 and 1676 - at least in the foundations and the walls. Facades and other shaping features were added in the course of refurbishments in the 18th century. If you enter the Heiligenkreuzerhof as I recommended it from the Schönlaterngasse, you will see a small chapel at your left hand side. It doesn′t look like anything to shout about from the outside. This is the Bernardiskapelle Chapel, and despite of its humble outside, it is one of Vienna′s finest little Baroque buildings. There is a bust of St. Bernhard of Clairvaux above the entrance, it is him to whom the chapel is dedicated. The Bernardiskapelle was built and opened relatively early for Eastern-Austrian Baroque - the construction started in 1662 and the building was opened in 1679. The chapel is closed most of the time, but it is worth looking up the limited opening hours. The interiors are a mind-blowing concentrate of marble, gold and paint. The altar painting was made by Mario Altomonte, who spent the last years of his life at the Heiligenkreuzerhof. The chapel is a very popular venue for weddings - the only time I have been in there was at a public showing, when the abbot of Heiligenkreuz performed Gregorian chants with a choir of novices. Quite a remarkable experience. The marble and plaster work, by the way, was made by Giovanni Giuliani, who was the teacher of Georg Raphael Donner. The latter is one of Austria′s most important sculptors of the Baroque - see the fountain on the Neuer Markt Square for an example of his work. The Bernardiskapelle was renovated, which caused a financial damage of 460,000 Euros. Attractions nearby include the Alte Aula, the Jesuite Church, the Dominican Church, the Stephansdom Cathedral and the Stadtpark as well as the Museum of Applied Art. The best thing you can do here, though, is to stroll around for a bit and enjoy the ancient buildings and narrow lanes. Here you can find the odd little café or specialist shop that might have that one bloody item you have been looking for since the 1980ies.